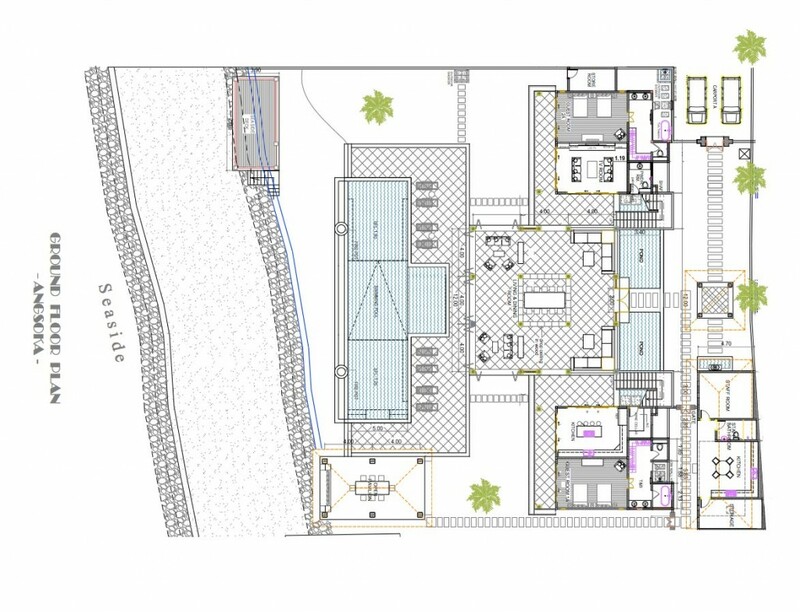 This impressive designer villa is located on over 1.500 sqm land, with close to 900 sq. m of luxury lifestyle. The huge living room, overlooking the 20×5 meter infinity pool with fire-pits and breath taking ocean panorama view in the background, is nothing but spectacular. 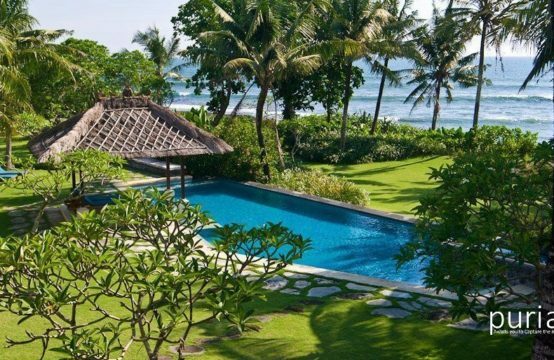 All the rooms in this spacious villa enjoy direct ocean view in Candi Dasa. Two big owners suites and 4 big guest rooms can accommodate most families or up to 12 good friends. Each of the 6 air conditioned bedrooms of Angsoka Beach Villa have a super king bed (200x200cm) of highest quality, a spacious en suite bathroom with separate shower and bathtub, plenty of wardrobe space and a safety deposit box for the guests convenience. 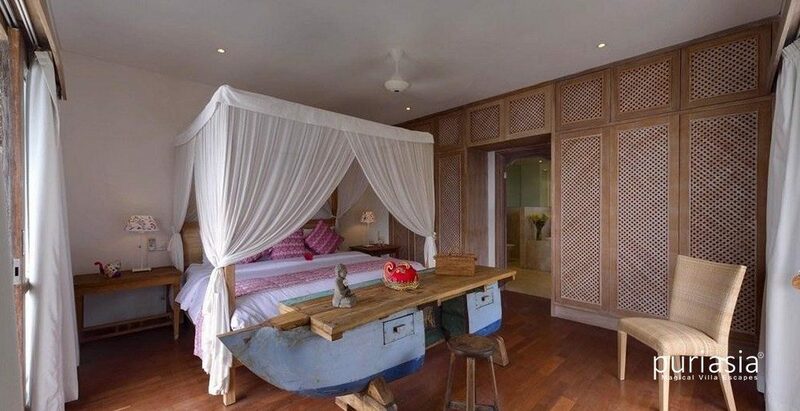 Outside of each bedroom upstairs, there are daybeds facing the ocean, for relaxation and privacy. 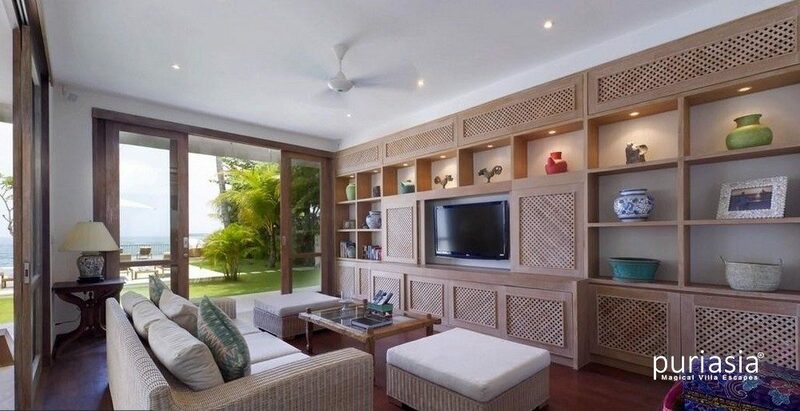 Adjacent to one side of the living room is an air conditioned media room and library with a 47” LCD TV, cable TV, DVD player and a state of the art stereo system that brings the music to Bose speakers in all the living areas. On the other side of the living room is the spacious connoisseur kitchen, reflecting the proprietors high regard for gourmet cooking and the good life. It is tempting to enjoy a cocktail on one of the bar stools around the cooking island when a delicious meal is on its way. 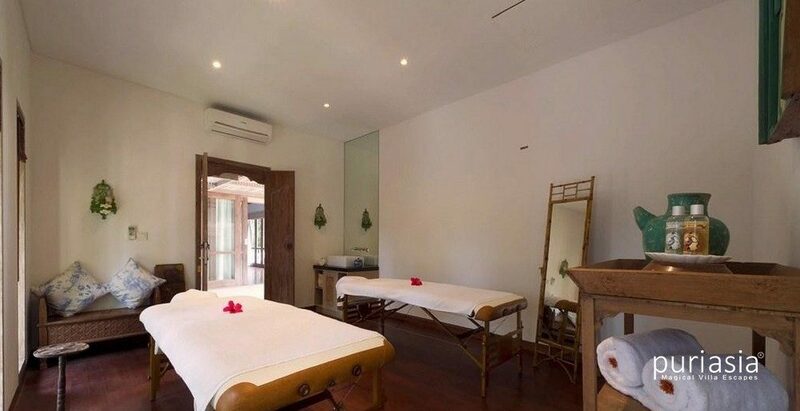 Angsoka Beach Villa also has a wine cellar and a guest powder room on the ground floor. Free wifi internet connection throughout the villa. 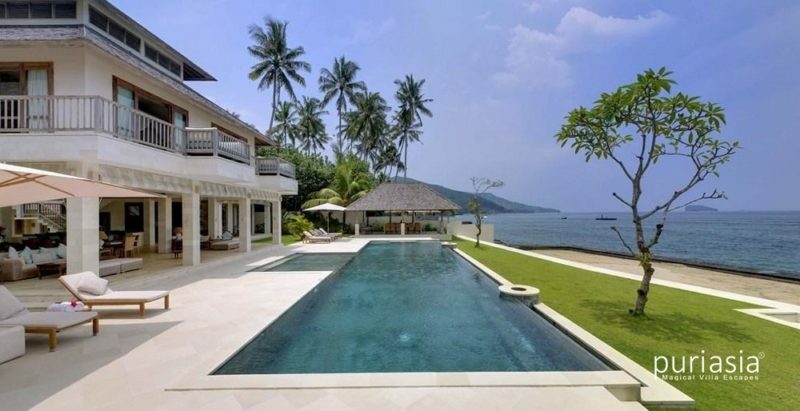 Angsoka Beach Villa has a vast area of terraces and sunbeds, with ample opportunity for both privacy and entertaining. Discreetly hidden in the back of the property, is the staff house, with an additional fully equipped kitchen and laundry. Upstairs you find two very spacious air conditioned owners suites filled with antiques. With super king beds of ultimate quality and mosquito nets, spectacular ocean view, walk in closets with plenty of space, private safety deposit boxes and luxurious bathrooms. 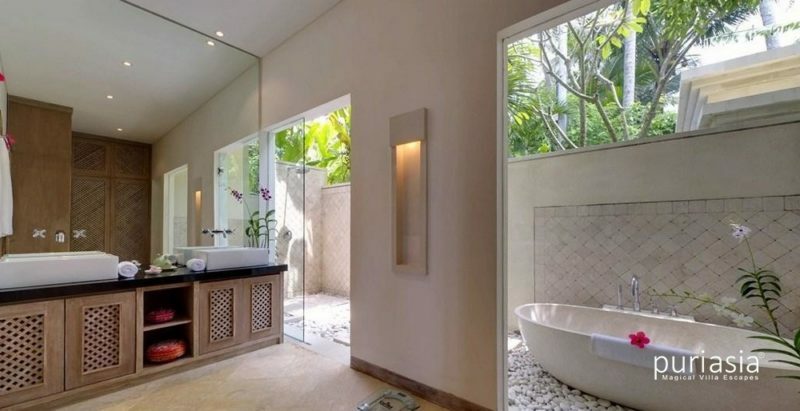 From these bathrooms you might on a clear day be lucky and see the magnificent Mount Agung. 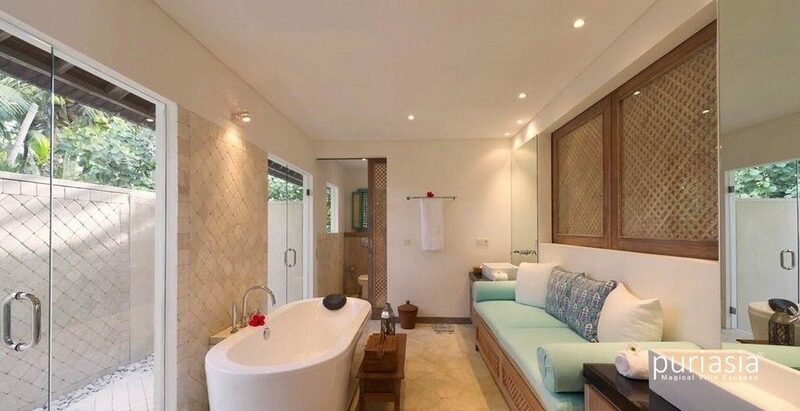 There are two more guest rooms both upstairs and downstairs, all air conditioned and spacious with the same luxurious super king beds and mosquito nets, safety deposit boxes and beautiful bathrooms. 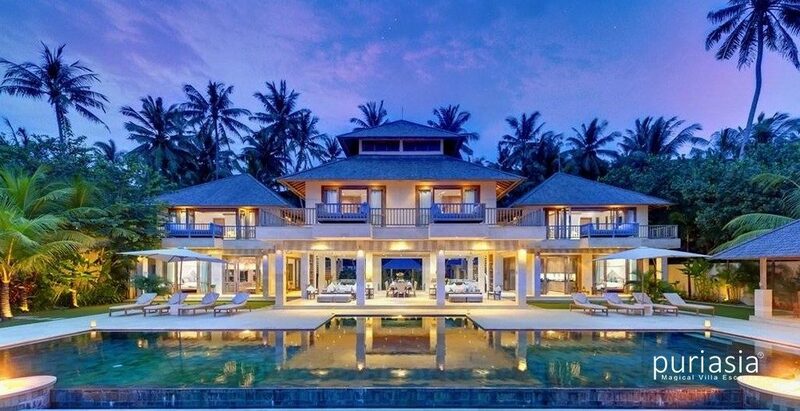 All of them with fabulous ocean view. 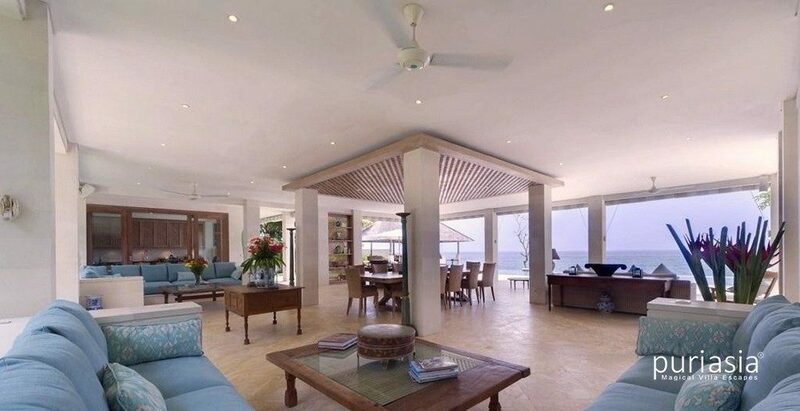 Angsoka Beach Villa can accommodate many guests without anyone feeling crowded. The living room has in all 4 seating areas to enjoy. Whether you want to directly overlook the infinity pool, or relax in one of the built-in corner sofas close to the pond, is up to you. 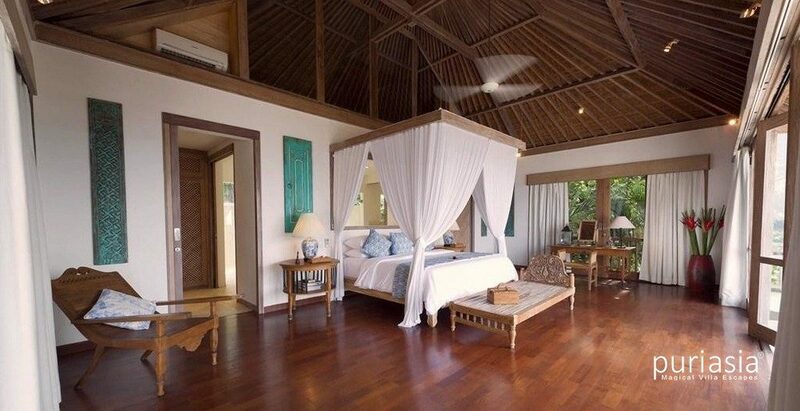 Carefully selected Balinese antiques and artifacts, makes a vast living area even cosy. 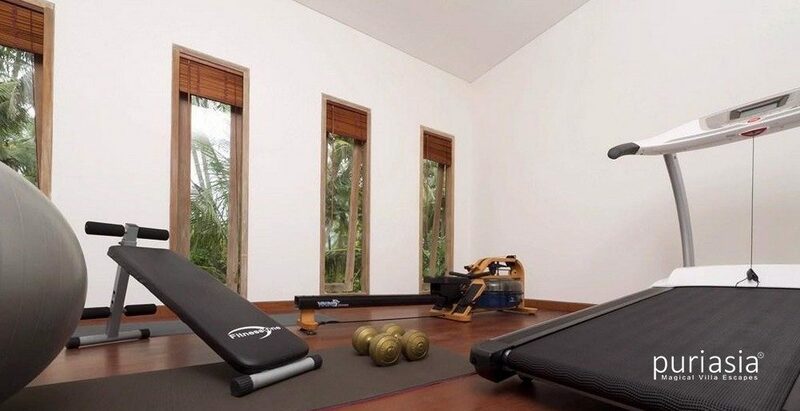 This entertainment retreat has air condition. The 47” LCD TV with cable connection to a large part of the world will keep you updated on the latest scores or keep you in touch with reality. The DVD player is open for any preference. The stereo sends your choice of music to all the Bose speakers in the living areas. 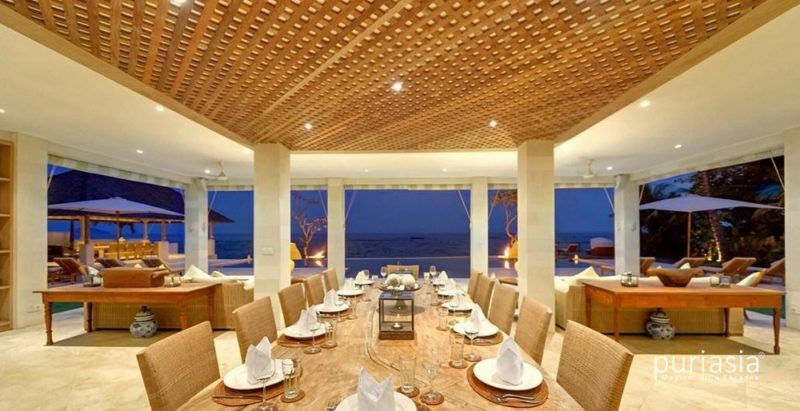 There are 3 alternative dining areas in Villa Angsoka. 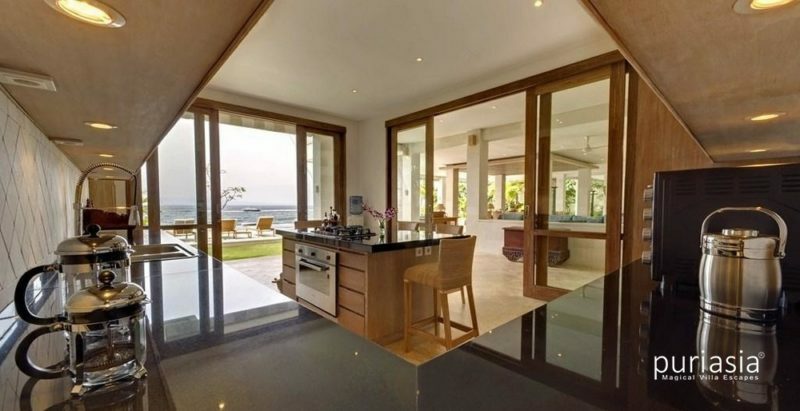 The most informal is in the beautiful kitchen, on a bar stool around the cooking island. Fun for kids or four adults, who wants a quick bite or a late night snack. 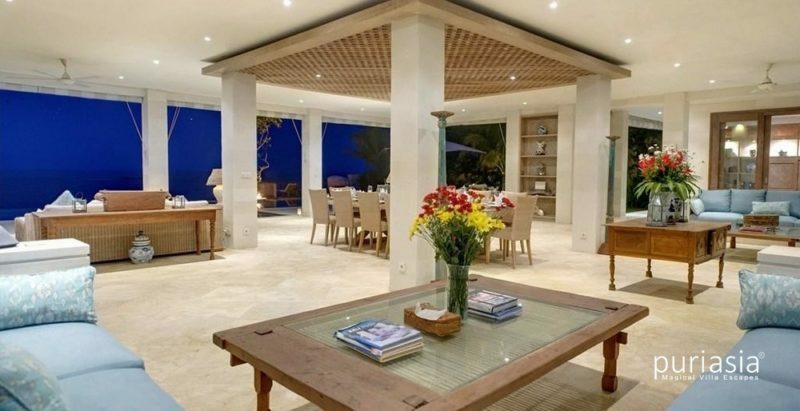 The most formal is around the fantastic dining table, made of one piece of wood, in the middle of the huge living room. Here you can dine 16 people. If you move the table from the Bale (gazebo) and add that, you can dine up to 28 people here. 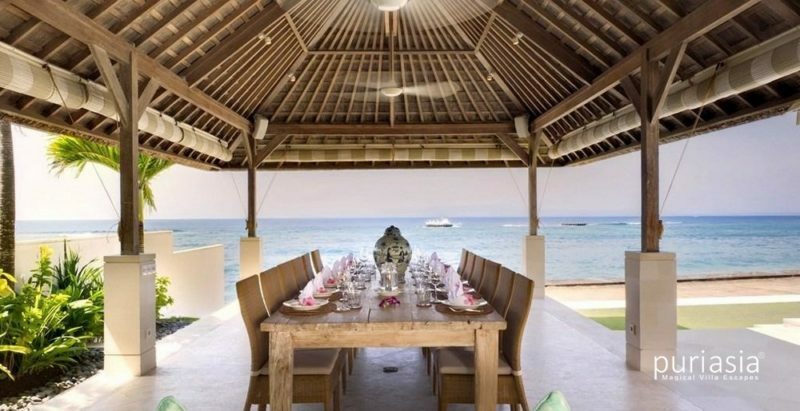 That gives room for all the guests in all the 3 villas of Siri Mendira Beach Villas. By experience, the most preferred dining area is in the Bale. 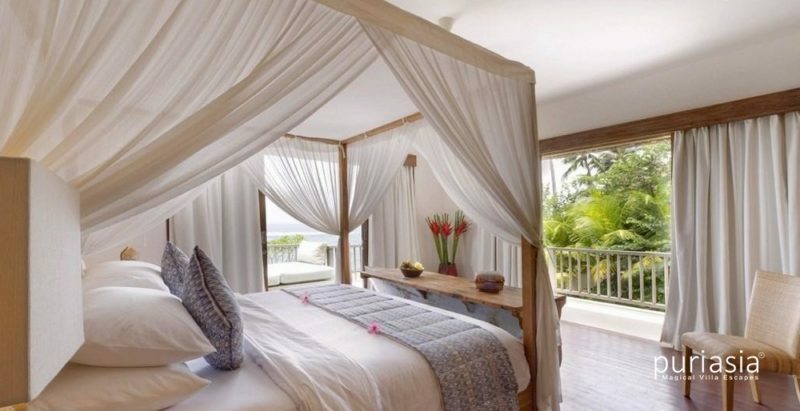 Here you can enjoy the sea breeze, the arm pinching ocean view and the moonlight at night. Here you really get the true feeling that you are in the tropical paradise of Bali. 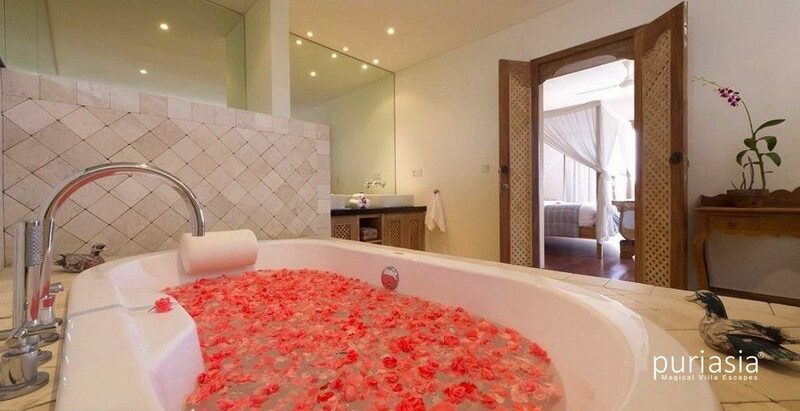 You will never want to leave. This is the most important room for those that love to create delicious meals, or have them made by our staff. Here you have all the space you need to create magic. Black granite counters, beautiful woodwork and a big double fridge/freezer with an ice-maker. Two stoves, one of them a 90 cm gas stove with a salamander on top. Perfect for grilling super king prawns, lobsters or other food that prefers to get grilled from the top. You can enjoy having a glass of wine or a late snack on one of the bar stools around the cooking island, or just have pizza time for the kids. The kitchen has air conditioning. This traditional treat you will learn to enjoy. An outdoor dining room, shaded from the sun, but open for the breeze. As long as the weather allows, this is where most guests love to enjoy their meals. If you want to take a swim before you finish your morning coffee, just jump in the pool. 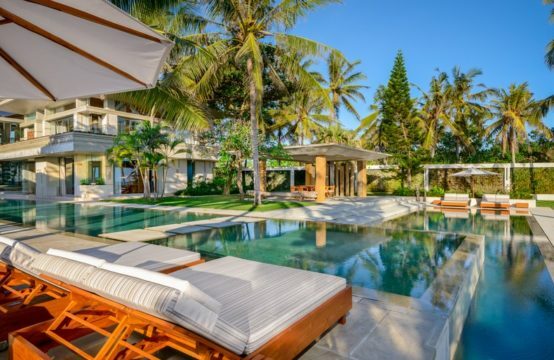 The beautiful white palimanan stone that covers all the terraces has a unique quality – it stays cool in the sun. The palimanan is a blessing for both small and big feet, when the sun is at the strongest. Air conditioned media room and library with a 47” LCD TV, cable TV, DVD player and a state of the art stereo system that brings the music to Bose speakers in all the living areas. *Rate is subject to 15,5 Percent Government Tax and Service. Please note the above rates for 2018 Season. Please email us if you would like to make a booking after this date.